Being a Saturday night (and to be honest being perennially partial to a drink) I was keen to check out Klaksvik’s pub, Roykstovan. I asked Valti if he wanted to join me, and he did, again I was glad of the company. Walking in it was quite smoky, and everyone was looking at us (in a “you’re not from round here” type way), but just as I was thinking it was a bit intimidating a three people came over to talk to us and it was all good natured. A couple of them worked on trade ships and one was a fisherman. We had a few beers, talked about Chelsea, Denmark and Faroese independence, and one of the group’s family – who lived in the Outer Hebrides. The beer kept flowing, then come kicking out time at the pub one of the group invited us back to his house. He had a shed at the side of the house where he hung up fish to dry (very typical in these parts), there are no flies in the Faroe Islands (as it’s too windy I guess) so the meat stays good. 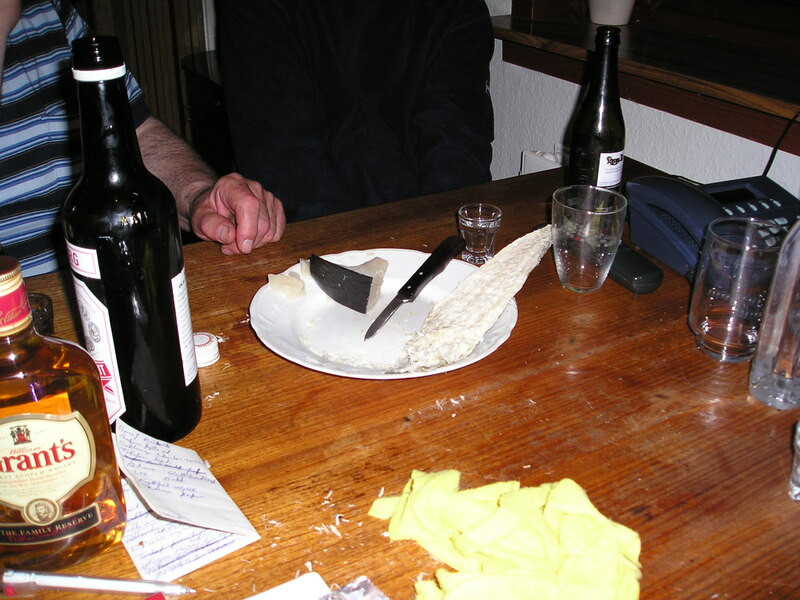 He also had whale blubber stored in a dustbin which I tried – very salty which complemented the beers we’d been drinking (better than a kebab I reckon). Also tried some of the dried fish called “Coot”, couldn’t work out what this was in English. It was now about 1 in the morning, and one of the younger guys in the group suggested we go to the nightclub in town. The club was everything you’d expect from a small town nightclub really, expensive to get in at 80Kr, and playing pretty awful RnB type music. Everyone in there was pretty drunk, myself included, which got me through the experience. I normally hate nightclubs but it can’t have been that bad as I stayed until kicking out time at 4 in the morning. Outside it was broad daylight (and pouring with rain) which felt somewhat bizarre. All in all a top night out, was really impressed by the hospitality the locals bestowed upon me. 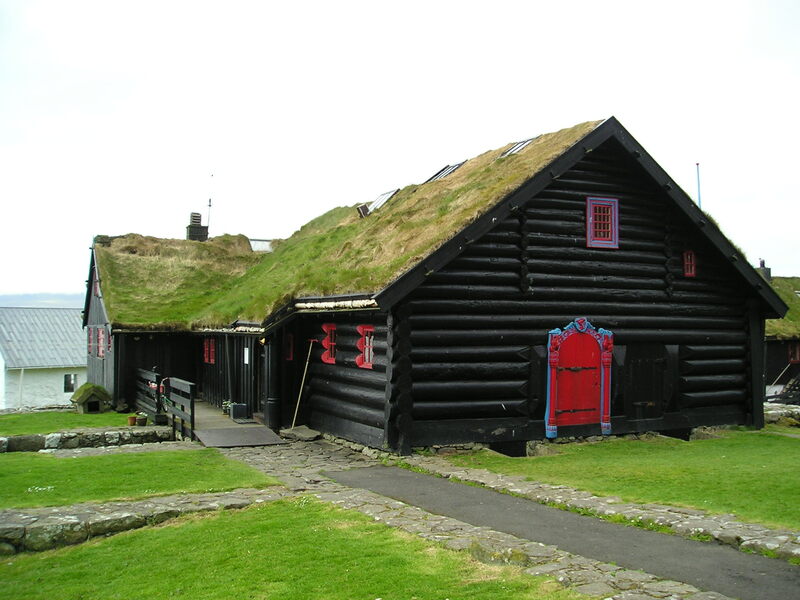 Day two on the Faroes, and after a great nights sleep at the Torshavn campsite I headed into town. My feet still ached, and concious of still having a lot of walking ahead I decided to take the bus rather than walk over the mountains to Kirkjubøur, the historic village on the other side of Streymoy which was my destination for the day. The bus to Kirkjubøur was more of a coach than a local bus service, very impressive really. And only 20Kr for the ride, and with just 4 passengers on the bus I wonder how much the government have to subsidise the service. 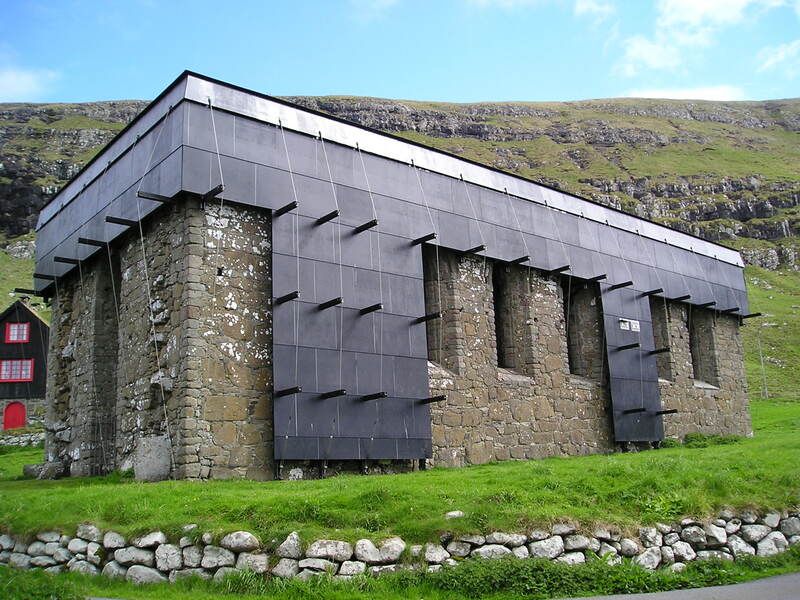 Kirkjubøur is a small but nonetheless impressive village, the main draw of the Magnus Cathedral was unfortunately covered in scaffolding, part of a project to dry out the walls (a difficult task given the Faroes climate) as the first part of a major restoration. There are controversial plans to add a roof to the cathedral (edit: as of 2005 when I first wrote this – anyone know if this happened or is happening?) 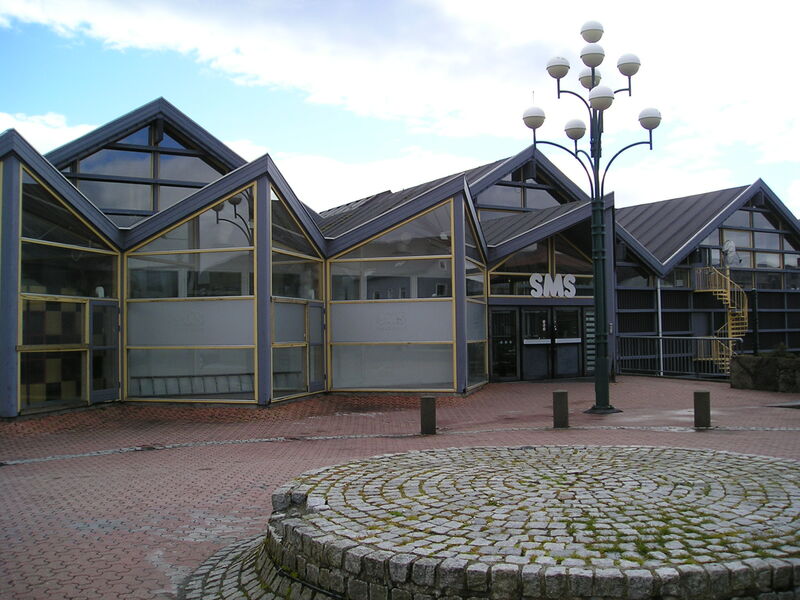 It’s an amazing building, was very struck by the very thick walls and it’s done well to (at least mostly) survive against the Faroese weather all these years. I also saw Roykstovan, which is apparently the oldest inhabited log building in Europe – quite a claim. 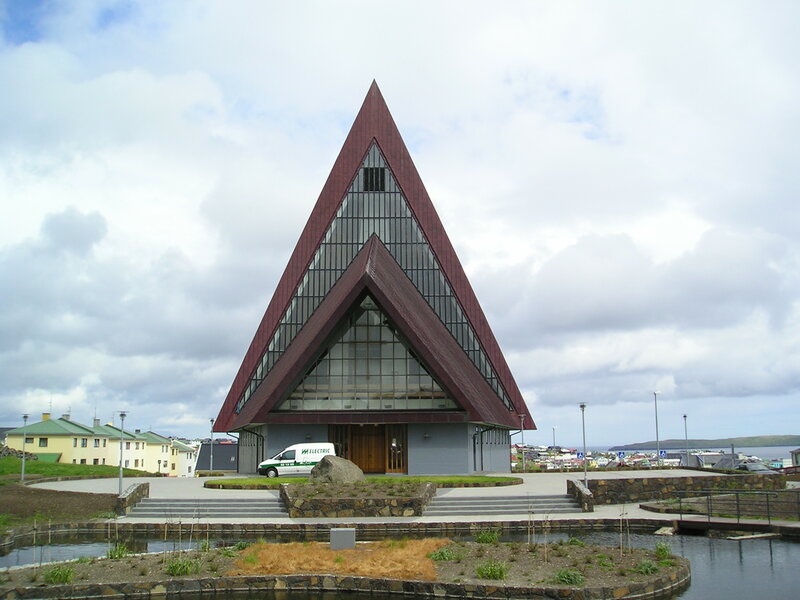 There was also a modern church. My feet were feeling alright so I decided to walk the three or four miles back to Torshavn. Back in town I walked past the Vesturkirkja church, unfortunately closed, an the museum of natural history. There was some interesting material about the geology of the islands, though it was all a bit dry, and none of the potentially more interesting stuff about the animals on the island was in English. Still, at only 20Kr entry I wasn’t too disappointed. It’s been a pretty good day weather wise, and I was able to check the forecast using the free internet at the national library and it looks like this will continue. My first soaked night in Shetland still lingers in the memory though and I’ve a feeling I’ll experience some proper Faroese weather before too long. I’d had enough sightseeing for the day so heading to Cafe Natur for a beer, had a Faroese dark beer which was pretty good. Then I went to Cleopatras Bar, described by my guidebook as “a good place for a midweek drink” but at 8 o’clock on such a midweek night I was the only one in there. Perhaps I need to get out of my English (early) drinking habits and adopt a more continental attitude.